It seems as though each passing day gets more hectic than the last. We live in a world that’s constantly on the move. In busy atmospheres, sometimes convenience trumps all. Perhaps the best example of all would be the plastic water bottle. No one can deny the ease of a grab-and-go bottle of fresh water. But is it really all that fresh? And are we really opting for the easiest, safest choice? Despite misleading labels, mostly all bottled water comes from a public water supply and is sold for an enormous increase in price. Why pay for glorified tap water? – Hormone blocking chemicals are added to single use bottles to soften the plastic. Use a BPA-free refillable water bottle to fill up at home. Many brands come with a built-in filter for added protection. – Purchase a Brita filter to keep cold tap water in the fridge and ready for use. Or attach a Brita filter right to the spout of your kitchen sink! This one-time purchase will save lots of money in the long run. Think of how much you spend on cases! – Speak up! Up to 70% of bottled water is exempt from FDA oversight. Contact your local reps or even members of the FDA to let them know you will not stand for unjust regulation of bottles. Here’s a little perspective: The energy used each year to make bottled water is enough to fuel more than 1 million cars for a year. 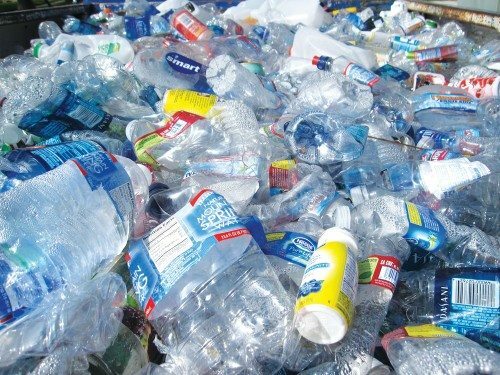 If bottled water was made from 25% recycled materials, that energy could power 680,000 homes for a year. In following the simple tips above and sharing them with others, you are largely contributing to a body of people who are making big changes not only to their own health, but also the world of water – something we all desperately rely upon.